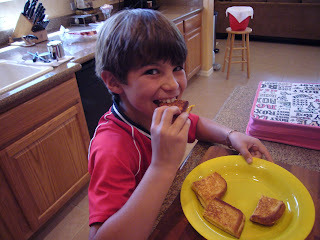 Since yesterday was Mother's Day, Alexander decided that he would make his own lunch so I could relax. Relax while watching him cook? I think not. However, he agreed to let me photograph him every step of the way (disguising the fact that I was supervising). 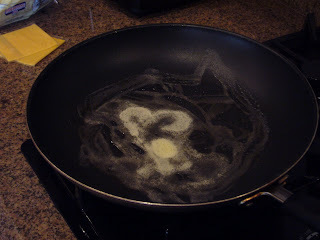 First step is to melt the butter in the pan. 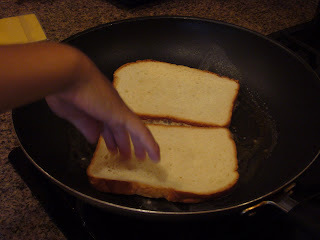 Then place the bread into the hot butter. 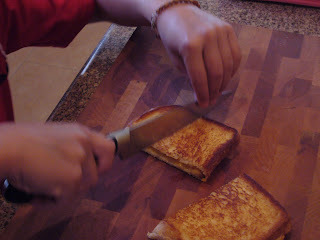 Then place the cheese on the bread - two slices of American - he hasn't graduated from the school of better cheese yet. Press down gently to help the two slices of bread stick together. 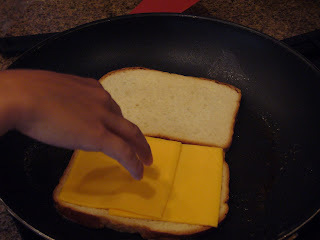 Cook until both sides are toasty brown. 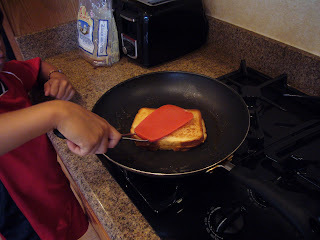 Then remove the sandwich to a cutting board and cut into whatever shapes you like. Alexander chose squares. The last step is the most important - enjoy your lunch! Coming up next time - Alexander will show us how he makes his cappuccinos!